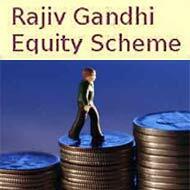 The mutual fund industry in India is increasing focusing on the Rajiv Gandhi Equity Saving Scheme after the government said that it would extend it for three successive years. The finance minister also allowed investors with Rs. 12 lakh income to invest in the schemes to get tax benefit from the financial year 2013-2014. About seven new offers are now available for the investors to take advantage of the scheme. Experts have said that such schemes offer a good entry point for the persons looking for the first time. There are several on-going new fund offers including Birla Sun Life RGESS, DSP BlackRock RGESS Fund, HDFCBSE RGESS, IDBIBSE RGESS Fund, LIC Nomura MF RGESS Fund Series - 1, and UTI Rajiv Gandhi Equity Saving Scheme. It is known that the first time investors with an annual income of below Rs. 10 lakh will be able to avail additional tax benefit under section 80 CCG for maximum investment up to Rs. 50,000. The benefit is other than the Rs. 1 Lakh exemption limit that is available for the investors under Sector 80C. The government has extended the annual income criteria to Rs 12 lakh for a period of the next three years.